Talking head style videos remain the best way to communicate with an audience in an honest, open and sincere way. We have made hundreds of these style of videos and each is unique and bespoke. We are happy and willing to read questions that you have supplied to get the answers you need for your video. However, if you have a script ready we can help you read this in sections or we can supply an autocue which makes it easy to get your message across without memorising. Another option we can help with if you are unsure about a talking head from within the company, is to hire in an actor which we can help source. We’ve worked previously with a number of good actors who work especially well with autocue. If you have worries about your talking head video, particularly how the person may come across then we can help to make the participant feel relaxed and give you multiple run-throughs until you feel happy with the final piece. We specialise in helping people feel more comfortable and getting the best video we can out of participants. We’ll listen to your direction; what do you imagine for your video? Do you see a particular theme? Are there specific requirements you need featured? We can ensure all your needs are fulfilled. Conversely if you’re not entirely sure what direction you want for your video we can offer our opinion of what will work best for your company based on past experience. Our video directors have strong visions and can offer the perfect solution for your finished video. Each video is of a high quality and will fit the essence of your brand. We’ve filmed hundreds of talking head videos, which are particularly popular for internal company videos, especially when introducing new employees to the company or if there are any major changes happening within the company. Some of the clients we have made talking head videos for include Ecclesiastical, Wickedly Welsh Chocolate Factory and Balfour Beatty. A talking head video doesn’t just include the shots of people talking, we can help it feel more of a complete video by adding in relevant cutaways. 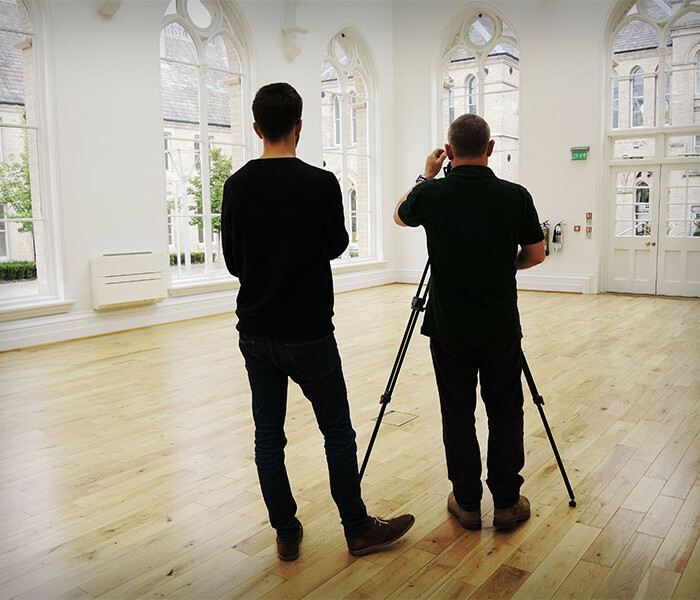 We can capture shots from around the workplace to give a feel of the working environment as well as using film standard equipment to acquire impressive cinematic sweeping shots of buildings or people working in office or on site. All of these options work well in between talking shots to make the video feel whole. Another option we can offer to break up the talking heads is animation. Is there a point you need to get across that can’t necessarily been shown through just words? Animation could be the answer. Our team have strong experience in creating animation for corporate videos. Be aware that creating animations for video can increase the delivery time of the video, though in special cases we can produce videos to tight schedules. We can offer a choice of backgrounds for you to choose from for your talking head video. We can offer a portable white infinity screen which can be easily put up in an office on your site or you can choose to shoot in front of the screen at our studio. We also have a green screen if you were to want a different background subbed in to the video. Perhaps you would like animations happening around your speaker in the video, or you could even film a location background to be added in during post-production. The final option is of course to shoot on location, a simple office background gives a genuine corporate feel to a video and could be the perfect choice for your business. If a talking head video sounds like something you could be interested in then don’t hesitate to contact our friendly team for a quote and to discuss your project. We’re confident we can create the perfect high quality video for you and your company and at a competitive rate.